A woman possessed of a coherent aesthetic sensibility and a wealthy husband, Sonia Knips (nee Baroness Poitiers des Eschellles) was a major patron of the the arts in fin-de-siècle Vienna. When she sat for her portrait by Gustave Klimt in 1898, she was a newlywed and he was an up-and-coming artist. 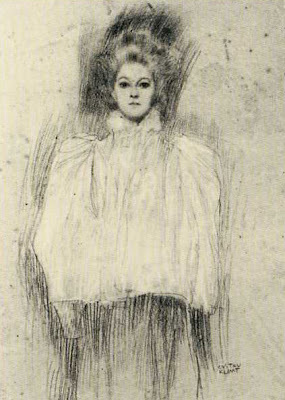 Sonia Knips had known Klimt before she was married (see the sketch below, made in 1887) and there had been some kind of a romance between the two, ending with his rejection of her according to those who knew both of them. 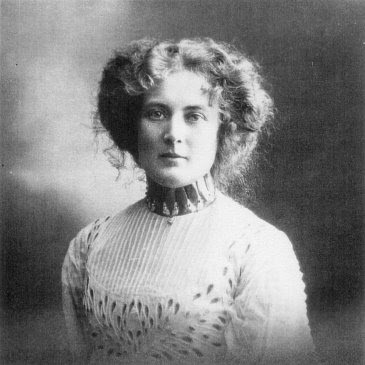 Knips also became acquainted with Klimt’s confidante, the designer Emile Floge; Knips wore and promoted 'reform dress', thereby making a material contribution to the emancipation of women in her day. With what mixture of emotions Knips regarded the portrait that brought Klimt his first great success, we can only speculate. 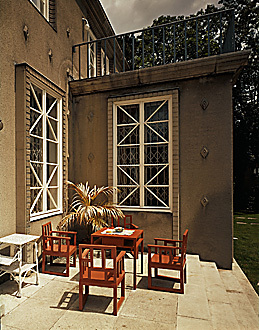 Sonia Knips also commissioned Josef Hoffmann to design a country house for her family in 1903 and then a family sepulcher in 1919. But the last thing Hoffmann designed for Sonia Knips – and his last urban villa – was a masterpiece on a level with Klimt's portrait. Villa Knips (1924-25) possesses an impressive Arts & Crafts façade, accented by rows of diamond-shaped ornaments that mimic the design of the windowpanes. 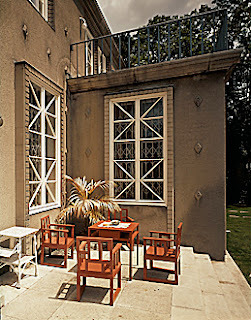 Even the patio furniture, similar in shape to Hoffmann's ground-breaking designs for the Purkersdorf Sanitarium, was all angles. Christine Ehrlich, a pupil of Hoffmann's, executed the exterior stucco decorative work. The interior, however, was designed by Dagobert Peche (“the greatest genius of ornament that Austria has possessed since the Baroque”). Sonia’s bedroom suite was described in the contemporary Viennese press as “ a cross between an Oriental divan and a French boudoir”, decorated with a Venus designed by Susi Singer, paintings by Maria Strauss-Likarz, a small bar, smoking accessories, sweets, and wool for knitting. 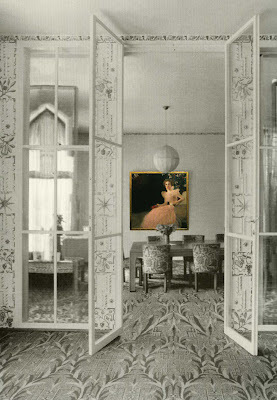 The suite also boasted a salon reserved for the aforementioned Klimt portrait. Her dressing room would be reconstructed at the Paris International Exposition of 1925, and later that same year displayed at Macy's New York store to much acclaim. 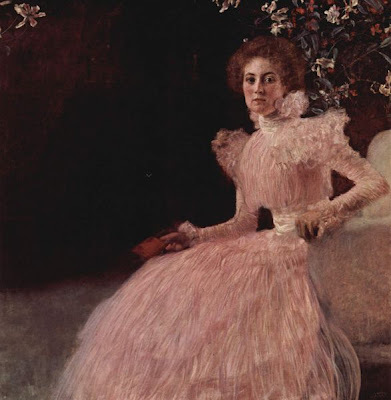 The young woman wearing a conventionally feminine ruffled dress who grasps the arms of her chair, slightly tense, in 1897 became a patron of one of the keenest aesthetic sensibilities of her day. Did Klimt the painter miss some aspect of her personality or, having been overlooked by the egotistical artist, did Knips choose to withhold her depths from his gaze? My name is Martin Christopher Happy, I am the great grandson of Sonia Knips and I am very pleased and happy to see this information I would like to know where to get copies and share with the rest of my family. Martin,I'm so pleased that you found this. I drew on three recent books: 1) Gustave Klimt: Painter of Women by Susanna Partsch (Prestel: 2006); The Ronald Lauder & Serge Sabarsky Collections (Neue Galarie/Prestel: 2007); and Klimt/Wagner ( published by Harper Design International: 2003). The small black and white photograph came via a blog at www.ilyaunsiecle.blog.lemonde/fr, from about a year ago. Sorry I don't have the exact date. The article indicated that the photo (c. 1890) is from the Le Monde Archives. Lara, thank you. I hope this article does its small part to bring Sonia Knips forward as a person of intelligence and accomplishment. So do you know any more on the Knips family history? 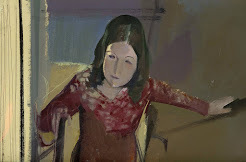 Iara, I became curious about Sonia Knips after seeing her portrait by Klimt at the Neue Galerie in New York City. I wish I did know more.